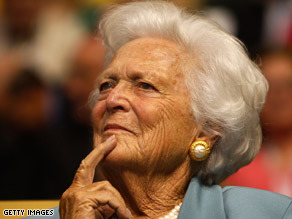 Former first lady Barbara Bush has been admitted to a Houston, Texas, hospital. (CNN) - Former first lady Barbara Bush was resting comfortably Wednesday after undergoing "routine" surgery Tuesday night to correct a perforated ulcer, according to Methodist Hospital in Houston, Texas. Surgeons patched and closed a one-centimeter hole in Bush's stomach caused by the ulcer, the hospital said in a news release Wednesday. Bush, 83, is expected to be discharged next week, it said. She was taken to the hospital Tuesday evening for tests after complaining of stomach pain for several days, said a family spokeswoman, Jean Becker. After she began feeling ill, Bush called her husband, former President George H.W. Bush, at his office to ask him to take her to the hospital. His Secret Service detail drove them both to the hospital, Becker said.